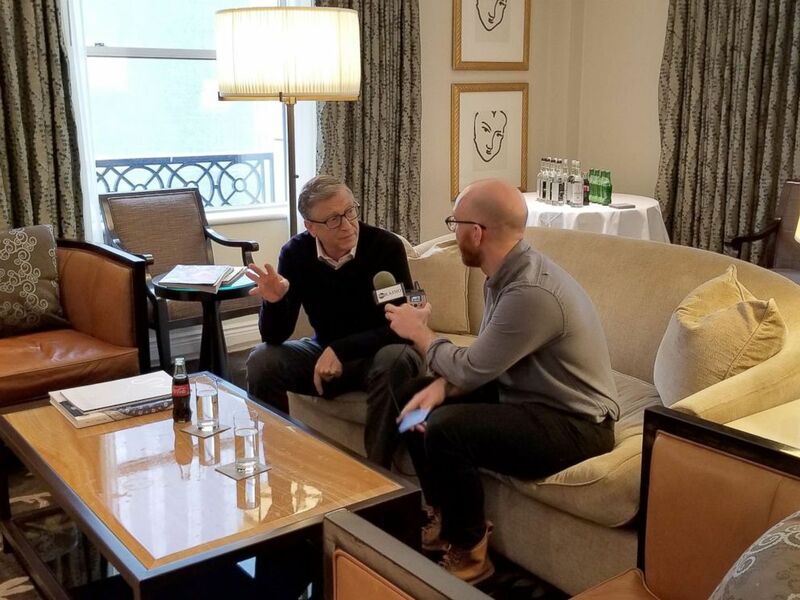 Bill Gates is interviewed by ABC News' Brad Mielke, Feb. 12, 2019. Bill Gates said on Tuesday he favored raising taxes -- especially on the wealthy -- and dodged a question about fellow billionaire Jeff Bezos and his fight with The National Enquirer. The Microsoft founder also reflected on the lack of women hired in the early days of Microsoft and his former "monomaniaical" management style in a wide-ranging interview with ABC News’ Brad Mielke, on the “Start Here” podcast. Gates spoke to media on Tuesday after the release of the Bill & Malinda Gates Foundation's annual letter, in which the couple highlights initiatives and issues important to their philanthropy. He dedicated this year’s letter to his Microsoft co-founder Paul Allen, who died in 2018. Gates confirmed that he is in favor of more progressive (higher) taxes on the wealthy, especially capital gains taxes on assets like stocks. The former richest man in the world has also consistently been a proponent of estate taxes. Gates did not give an exact figure for how much he would like to see taxes increase. Gates also said he wished he had hired more women in his earlier days at the company. “The intensity I brought to the job, working day and night, being kind of monomaniacal, I'm sure for some of the people who worked for me it didn't get their best performance. Sadly it was mostly young males working on these things. Maybe we could have drawn more women in if we were a little bit less intense,” Gates said. Gates was circumspect when asked about Jeff Bezos, who has publicly accused The National Enquirer and its parent company, AMI, of blackmail and extortion. The tabloid broke news of the Amazon founder’s extramarital affair last month, and was threatening to expose more details, including intimate photos. The company has denied the extortion and blackmail claims. “I don't bring anything new to that. You know, Jeff has done an amazing job at Amazon getting people products of low cost, you know, figuring out voice computing,” Gates said. Last week, Bezos wrote a Medium post seeming to imply the National Enquirer’s reporting about his personal life was motivated by The Washington Post -- owned by Bezos -- and its aggressive coverage of the Trump administration and Saudi Arabia. When asked again if he was supporting Bezos, Gates appeared to dodge the question. This report was featured in the Wednesday, Feb. 13, 2019, episode of ABC News' daily news podcast, "Start Here." **OSBORNE/DOOM** -- PASTE TODAY'S START HERE PLAYER EMBED CODE FROM TUNEIN HERE!!! !